Jo took the PAAVQ-SET Diploma as it fulfilled a number of criteria. • start a business to replace income from her role as a teacher of gifted students. She could sew, in fact she loved it, but she felt the gaining of a Diploma would give her the confidence needed to take that next step. Jo appreciated the challenge of the Diploma particularly in patternmaking. In 2013 the Academy employed Julia Barnes whose technical skills and teaching style particularly appealed to Jo, she felt stretched and responded to the challenge coming amongst the top in the patternmaking exam. At the end of the Diploma, Jo started Funky Forms where she now has the skills needed to take her in any direction she wishes to go. A woman of many talents this start up business is allowing Jo to find out what she enjoys the most. As a committed over achiever the business will take on: – alterations, dressmaking, costuming, teaching teens to sew, and recently setting up a community class to do embroidery. Jo uses Facebook and word of mouth as her advertising, this is giving her plenty of varied work at the moment. She will shortly have to decide which direction she will take the business but with teaching and sewing she is combining two of the things she loves, but there really is no limit in any direction for this woman. Jo is based in Parau (which surprisingly is in the Auckland region) the closest township being Titirangi, but that doesn’t stop her from having clients in Albany and in fact all around the Auckland area. Jo was recently awarded for exceptional tutelage of adults by UNESCO, a total surprise! She started a community class in Green Bay and was nominated by the lovely Moana from Green Bay Community House who nominated her for an Adult Learning Week award. What she wrote about Jo and her classes was wonderful and Jo was truly humbled. One of Jo’s friends called on her to alter her wedding dress so she could re-take her vows with her husband. and repurpose the gown. The bride (and groom) look very happy with the current result. Other clients find beautiful dresses at Op Shops and ask Jo to create an updated version. Jo takes a pattern and voilà, a dress that fits them and looks totally original. Jo’s studio is currently in her rumpus room with 6 domestic machines; she won a machine around the time she left the Academy, and has purchased more from the great folks at Sewing Time Onehunga. With the amount of work she is doing she finds the cover seamer invaluable, recently hemming 50 softball jerseys for a client. And just when you think this talented woman can’t do anymore Jo is also a spokesperson for people suffering from bipolar disorder. She even has a number plate on her car BIPOLR! 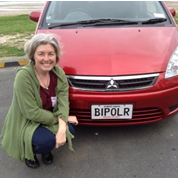 With the amount of driving from Parau out and about around Auckland, she is definitely spreading the word. You can find a copy of her article in “That’s Life NZ” week ending 14th of September 2014.